More than 170,000 people from all over the world descended upon the Las Vegas Strip to attend CES 2018. Once again, The City That Never Sleeps hosted the annual Consumer Electronic Show, which inhabited the Sands Expo at The Venetian, ARIA Casino and Resort as well as the Las Vegas Convention and World Trade Center. Attendees and exhibitors felt the excitement and anticipation of the latest and greatest tech as they landed at the McCarran International Airport. From the badge pickup station to the taxi line, this was just the beginning of crowds and lines awaiting them on the show floor. Xfinity made its sophomore appearance at the tech show where nearly 4,000 companies from tech powerhouses to innovative startups from all industries came to show off their latest innovations to the global market. This year, companies treated attendees to all facets of tech, from audio, vehicle technology and wireless to drones, augmented and virtual reality, 3D printing, sensor tech and robotics to name a few. Xfinity introduced free home automation giving its millions of customers efficient, easy and seamless control over their IoT devices in the home. 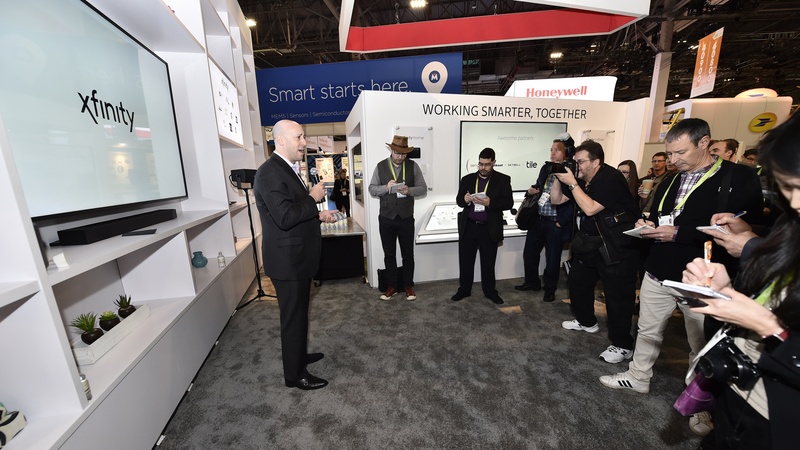 Before the show floor opened to the public, dozens of high-profile tech media were invited to the Xfinity Home Automation booth. Comcast announced plans to add home automation to its Xfinity internet service, putting free, smart home controls in the hands of more than 15 million customers and accelerating the overall adoption of connected devices and Internet of Things’ experiences. According to research, by 2020 Americans will have an average of 50 Wi-Fi connected devices in their homes. Xfinity Internet customers that use Xfinity xFi, a free cloud-based home WiFi management platform, will soon be able to use the xFi app to control hundreds of devices from popular brands like August, Carrier, Chamberlain, Ecobee, GE, Honeywell, Kwikset, Liftmaster, LIFX, Lutron, Nest, Netgear Arlo, Philips Hue, Poly Control, Sengled, Skybell, Tile, and Zen at no additional charge. xFi will even make in-app, automation recommendations to the user, based on the type of device that is being connected to their network. Comcast expects to add these new features to xFi later this year and will add more IoT and digital experiences across a range of categories including wearables, automotive, voice assistants, news, social media, email, maps, gaming, and reviews. Get your weekday mornings started right by fading on your lights, turning on your X1 enabled TV to a news station and displaying your local weather, commute times, and fitness goals for the day. Keep family dinner nights special by using voice to easily pause the family’s devices while dimming the lights and playing background music. Go to sleep easier by dimming the lights, adjusting the thermostats, pausing children’s devices, and arming your security cameras… all at the tap of a button. xFi instantly identifies the manufacturer, type, and model of a device that is being added to the home network, making it even easier for customers to onboard devices, name them, and organize them by owner. When a customer adds a streaming video or gaming device, xFi automatically tests the WiFi signal strength based on proximity to the wireless gateway device to help ensure a great experience. If the signal is not optimized, xFi will push an alert through the app with suggestions about device or gateway placement. Customers can now use the xFi app to conduct WiFi coverage tests throughout their home and identify areas where signal strength is strongest and weakest. Customers in Boston, Denver, and Chicago can currently purchase xFi Pods, mesh WiFi extenders, that cost $119 for a three-pack and $199 for a six-pack. These no-configuration, adaptive xFi Pods help ensure coverage to even the most remote areas of the home. They will be available to all of the company’s Xfinity Internet customers later this year. Comcast launched Xfinity xFi in May 2017 to provide customers with a simple digital dashboard to set up their home Wi-Fi network, find their password, see what devices are connected, troubleshoot issues, set parental controls and even pause Wi-Fi access on their home network during dinner or bedtime. The xFi experience is currently available to the 15 million Xfinity Internet customers with a compatible device – the xFi Wireless Gateway or the xFi Advanced Gateway – and can be controlled via a mobile app, website and on the TV with the X1 voice remote. Comcast recently acquired Stringify, an award-winning tech startup that provides a cloud-powered automation service for 500-plus products and services. The company’s technology will be integrated into xFi to enable these new home smart home experiences.